Berlin buzz: Following several post qualifying penalties, the Berlin ePrix 2016 turned into a race to remember. After a late Safety Car phase, Sebastien Buemi was able to secure the victory ahead of local heroes Daniel Abt and Lucas di Grassi. 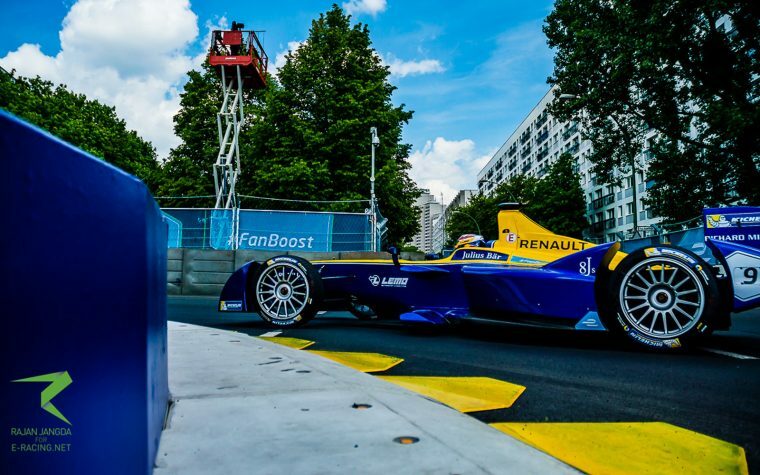 The long run-down to the tight first corner had everyone watching the Berlin ePrix at the edge of their seats: Sebastien Buemi (Renault e.dams) had a lightning start from the front row and dashed past pole sitter Jean-Eric Vergne (DS Virgin Racing). The Frenchman however was not one to let this go, and immediately began to chase down his rival. Behind the leading duo however, the positions remained the same, although it seemed as if Nelson Piquet Jr. (NEXTEV TCR) would be in trouble: The Brasilian lost grip in the first corner and began to slide away, but eventually he was able to regain control and the incident remained without consequences. Sam Bird (DS Virgin Racing) in fifth place had contact that left his front wing end plate damaged, and so did Bruno Senna (Mahindra Racing). Rene Rast (Team Aguri) lost his rear wing in the start phase as well. Vergne did his best to chase down the leading Buemi in the first lap, and at the beginning of lap two he was able to get revenge: He sliced past the e.dams driver in Turn 1, however, he was not able to shake off Buemi. The Swiss driver was able to stay within striking distance and eventually reclaimed the lead in lap 6. Vergne fell then back into the clutches of a charging Daniel Abt (Abt Schaeffler Audi Sport) who in turn was chased by Bird. However, the early stage of the race was interrupted by the stewards: The first one to be shown a black flag with an orange disc was Rene Rast in lap 5, whose damaged rear wing was barely hanging on to the Aguri car. The next one to be called into the pits was Piquet Jr, and eventually it would also hit Bird with his loose front wing end plate, which was particularly bitter for the British driver as he had to enter the pits from fourth place. At the front of the field, Buemi was pulling away untroubled, while behind him the battle for second place raged on: Vergne had managed to hold onto his position despite the heavy pressure from Abt, however, in lap 11 the German was able to make it past his rival and set off to chase the race leader. Vergne, who had lost a lot of time fending off Abt, had a train shape up behind him: He was attacked by Renault e.dams driver Nicolas Prost and Lucas Di Grassi (Abt Schaeffler Audi Sport) was lurking behind the pair waiting for his chance to strike. However, Vergne was able to remain ahead of his countryman with a lot of effort. Meanwhile, Frijns, who had fought his way up into the top ten, made a brave overtake for seventh place, sliding and drifting through a corner to pass Loic Duval (Dragon Racing). Afterwards, Duval came under pressure from Mike Conway (Venturi), although the Venturi driver had to focus on his own rear soon afterwards when he was attacked by a dashing Nick Heidfeld (Mahindra Racing). The drama at the front continued: Vergne, still under pressure of Prost, lost a front wing end plate in the heat of the battle, and he was told by the stewards to stop and have his car repaired. With the pit stop window within sight, Vergne tried to hold on and keep going for as long as possible to repair the damage during his regular stop. However, just before the stops were due, Vergne bounced over the curbs just a bit too hard and his entire front wing came off, leaving debris over the track and dropping Vergne back to seventh place. Then it was time for the pit stops: the race leaders entered the pits right away, while Di Grassi in fifth place decided to remain outside for one more lap, which would prove to be crucial in his race later on. After the stops were done, the order was as follows: Buemi was still in the lead ahead of Abt, Prost, Di Grassi, Vergne, Frijns, and Duval. The debris left by Vergne’s front wing was removed during a full course yellow, and in lap 30 the racing resumed. The battle behind Buemi kept on raging: Abt, Prost, and Di Grassi were all within a second of each other, and Di Grassi, having a bit more energy left that his rivals due to the later stop, was able to push and attack Prost. During the battle of the two, Abt was able to pull away a bit and focus on closing in on Buemi. In lap 40, di Grassi was eventually able to make it past the Renault e.dams. Behind the top drivers, Heidfeld fought teeth and claw to overtake Frijns, but even with the Fanboost he was not able to make his moves work. Stephane Sarrazin (Venturi) attacked Simona de Silvestro (Andretti) for the final point, but the Venturi man was not able to overtake. Di Grassi, now in third place and on course for a podium, pulled away from Prost and caught up to his team mate, who had been held up behind the lapped Bird. However, it was soon announced that he was under investigation for speeding under full course yellow flags. In lap 43, just when it seemed that things would heat up, Duval lost control of his car and ended up in the wall, bringing the safety car out and neutralising both the race as well as the gaps between the leading drivers. When the race was re-started, two laps were left to run. 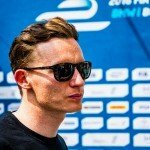 No one made a mistake at the restart, and although Abt remained close to Buemi, ultimately he was not able to challenge the Renault e.dams driver for the win. Buemi crossed the finish line as the winner of the Berlin ePrix. However, the fight for second place proved to be more exciting: Abt was told that di Grassi behind him was faster, but the German held on to second place, his best result in this season. Di Grassi followed his team mate across the finish line to complete the podium. Prost finished the race in fourth place ahead of Vergne, Frijns, Heidfeld, Conway, Simona de Silvestro, and Stephane Sarrazin. Sebastien Buemi took the lead on the first lap but Jean-Eric Vergne took his position back on lap two. Nevertheless, Buemi positioned himself in P1 for good on lap 6, leading until Lucas di Grassi pulled off a different strategy and as a consequence led the race on lap 25. Sebastien Buemi received 25 points for the victory. 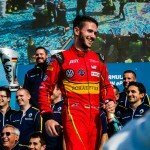 Daniel Abt collected 18 points for P2 while his teammate Lucas di Grassi was able to secure 15 vital points for the championship as he finished the race in third. After finishing P10 in Paris, Daniel Abt was able to secure his best ever result in Formula E with a strong P2 in front of his home crowd. The same applies to Nick Heidfeld who improved five places compared to his result in Paris. Simona de Silvestro – after a strong qualifying – was able to secure a strong P9 which is an improvement of six positions compared to Paris. After his post qualifying penalty, Nick Heidfeld recovered from P16 to P9. Stephane Sarrazin was unlucky as well, receiving a grid penalty, too and starting fro mthe pitlane due to technical issues. Nevertheless, the Frenchman was able to move up to P10, taking one point after an eventful race. Robin Frinjs made up six positions, moving from P12 to P6. After starting P9, Loic Duval struggled during the race and eventually had to retire from the race a few laps before the end of the race when he got amerous with the wall. Both Nelson Piquet Jr and Sam Bird had front wing damage which forced them to do an extra stop as they were shown the black flag with orange disc. The fastest lap was set by Bruno Senna with an impressive 59.067. Based on their free practice 1 performance and their quickest qualifying lap, Simona de Silvestro, Jean-Eric Vergne and Ma Qing Hua showed the biggest performance improvement throughout the day. De Silvestro gained 2.192 seconds in comparison, while Vergne was 2.186 seconds quicker in qualifying. Ma improved his performance by 1.824 seconds.